FILE - Syrian refugee children play at an informal refugee camp, which is seen set between the houses and buildings in Arsal, near the border with Syria, east Lebanon, June 13, 2018. Syrian refugees and aid groups, including the United Nations High Commissioner for Refugees, are concerned about a plan proposed by Russia to repatriate Syrians from Lebanon and Jordan to Syria, calling the move premature and risky, as the country is still not prepared and safe enough for the return of refugees. “Returnees receive counseling by UNHCR prior to their departure. UNHCR so far does not facilitate returns because we believe that conditions are not yet ready. But we provide counseling to those refugees that approach the government [Jordan] and UNHCR with a wish to return,” Nida Yassin, of UNHCR's external relations in Jordan, told VOA. “UNHCR strongly believes it is important that refugees make their own informed decisions about returning, and that it should be completely voluntary,” Yassin said. Russia is reportedly mulling over a plan with the Syrian government and some of the countries that host Syrian refugees to facilitate the return of refugees to Syria. Last week, Russian President Vladimir Putin, during his visit to Germany to discuss Syria and refugee issues with German officials, stressed on the importance of returning Syrians to their country. “I remind you that there are a million refugees in Jordan and a million in Lebanon. There are 3 million refugees in Turkey. 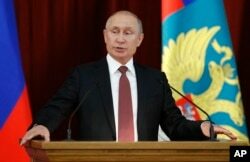 This is potentially a huge burden on Europe, so it is better to do everything possible so that they can return home,” Putin told reporters in Berlin. Russian officials have called on international donors to help support the reconstruction of war-torn Syria and facilitate the return of Syrian refugees back to their country. Last month, Alexander Lavrentyev, Russia’s envoy to Syria, visited Damascus, Amman and Beirut, and urged key actors in Syria not to “politicize” what he called a “humanitarian issue.” He also called on international organizations to support the process of rebuilding Syria. Syrian state media also reported last week that the Syrian government had created a coordination committee to help facilitate the potential return of refugees. Some experts charge that under the pretext of humanitarian aid, Russia is actually making an effort to score political points for Syrian President Bashar al-Assad following his military gains in recent months against the country’s rebels, with the help of Russia. “Russia knows the file of refugees will be the passage to convince the rest of the world of rehabilitating the Syrian regime and start financing reconstruction,” Khattar Abou Diab, a professor of international affairs at the University of Paris in France, told VOA. Abou Diab added that with millions of Syrians displaced internally and externally, the priority should be to stabilize the country and prepare the ground for the people to return voluntarily. There is some support for the Russian plan among regional countries. The Lebanese government welcomed it. Russia has discussed its plan with the United States as well, but both countries failed to reach an agreement. The United States emphasized following UNHCR’s procedure. “We support refugees going home under these conditions — safe, voluntary, dignified returns at the time of their choosing and when it is safe to do so,” Heather Nauert, a spokesperson for the U.S. State Department, said during a briefing last month. “I don’t think the situation, as UNHCR backs up right now, allows for that at this time. Hopefully, someday people will be able to head back home,” Nauert added. Refugees such as Huda al-Khteeb are concerned they might be repatriated to Syria against their will. “I am against returning to Syria at this moment. I have my fears over retaliation and persecution,” al-Khteeb, a Syrian refugee in Lebanon, told VOA. Al-Khteeb lost her husband in 2011 after Syrian forces shot him during a peaceful protest in the Damascus countryside. One of her sons was also killed when he tried to defect from the Syrian army in 2012. Al-Khteeb said Syrian forces killed her son in retaliation. Al-Khteeb fled to Lebanon after her house in the Qalamoun area of northeast Damascus was destroyed during a bombing by Syrian forces. Now, she lives in the Arsal area of northeastern Lebanon. Despite being homesick, she fears for her safety and that of another son, who was injured and paralyzed in a shelling by pro-Assad forces in 2012. Despite the risks, some refugees still want to return to Syria, as they have experienced hardships and dire conditions in the refugee camps outside of Syria. Some displaced Syrians say that a political transition in Syria will give them a sense of security for returning home. “We want to go back to our homes. But after seven years of destruction and death, who will guarantee people’s safety?” Khalid Ayoush, a Syrian refugee in Lebanon, told VOA. “Only a political change can guarantee the return of the refugees,” he said. Ayoush said there are many unanswered questions regarding the situation of different refugee groups, including men between 18 and 45 years of age and who are by law required to sign up for two years of military service. “There is also those who defected from the army. What will be their fate? What about the young men who were called to enlist in military service, and they will probably be taken to fight on the frontlines?” Ayoush asked. Hundreds of thousands of Syrians have been killed in the country’s seven-year civil war, with millions displaced internally and externally. UNHCR estimates that the population in pre-war Syria was 22 million. Now, about 6 million have been internally displaced, and more than 5 million have left the country, temporarily settling in neighboring countries, including Turkey, Jordan and Lebanon. Some have also gone to Europe.